The Little White Horse by Elizabeth Goudge is a historical fantasy young adult or possibly children’s romance. But since it was published in 1946, you’ll probably never see it reviewed that way. It tells the story of a thirteen-year-old girl named Maria who is orphaned and sent to live with an uncle in the village of Silverymoon. She brings her governess Miss Heliotrope and a Cavalier King Charles Spaniel named Winston. Upon her arrival, she is shown to a pretty little tower room with a little girl sized door and whimsical furniture. An unseen someone brings her slightly outdated clothing to wear and leaves sugar biscuits on her windowsill for a pre-breakfast snack. We come to find out that Maria and all the Merryweather family are either sun Merryweathers or moon Merryweathers and it isn’t very long before all and sundry are referring to Maria as a moon princess. She formerly also had a friend in London named Robin who everyone else thought was imaginary. But it turns out he actually lives there in the village. The Little White Horse is pretty different from anything you would read as modern YA. For one thing, the pace is glacial. Hardly any action-oriented thing happens until the last 20 pages of the book. There are three romances in it, one between first cousins who first met at 10 and 25 years old, one between second cousins who get married at 14 and one between a parson and a governess who met when he was her tutor as a child. It’s all presented very matter-of-factly. I very much doubt it was quite the standard for 1946. I perhaps buy it as more standard for 1842 when the book is set. But a book set in 1842 written for children or young adults today would almost certainly not depict such relationships, historically accurate or not. Then there’s the overwhelmingly Christian worldview of the book: a tone much in the same vein as C.S. Lewis or George MacDonald and gobs of Biblical imagery. Then there’s the delicate heroine who loves embroidery, translates French poetry and is afraid to climb trees. She gets a little more adventurous toward the end, but the gender norms here are far from progressive. All that said, I thought the book was rather charming and laugh out loud funny in spots. There are a few highlights. There’s a large dog named Wrolf, a rabbit named Serena, a pony named Periwinkle, the aforementioned spaniel named Winston and preternaturally smart cat named Zachariah that all play an enormous part in the narrative. They’re all clearly intelligent and communicate freely with the protagonists, though don’t actually speak. The Old Parson is a true man of God, taking his duties seriously, but only in the best ways. He’s warm, loving, intelligent and well-read. It’s quite a contrast to how most preachers are portrayed in fiction. Upper-class Maria and lower-class Robin are both a young thirteen, but in a way that feels refreshing. Maria embroiders and Robin watches sheep, but neither of these activities are judged as being bad or good; they just are. I thought the characters were both nicely balanced. Their expectations and adventures were quite within the capabilities of an average human despite the fantastic setting. For a fairy tale, they’re quite un-epic, which was welcome in a market now saturated with super-humanness. The most difficult things Maria does are climbing a tree and giving up a necklace that she doesn’t want to relinquish. Both those things would be very relatable to a young child, I think. I was made aware of the book via a movie called The Secret of Moonacre, an adaptation that didn’t do terribly well and that also bears very little resemblance to the book, but now having read it, I can understand why. For in order for everything to be put right in Silverymoon, three things need to happen: a place called Paradise Hill that the Merryweathers stole from some monks ages ago has to be returned to God, Maria has to prove that an ancient ancestor of a terribly wicked neighbor was not murdered by her ancestor and she has to find and return a string of moon pearls to that same neighbor. Plus, in order to be happy together, Maria and Robin must learn not to get angry or be aggravating. Like any fairy tale, it has wisdom to impart: it encourages patience, love, honesty and a distinct lack of attachment to material wealth. To be honest, I’m not sure anyone except me would much like it, but I’ve always had a thing for stories along the line of folktales, especially ones with romantic elements and happy endings. The Little White Horse is an original, pretty, amusing example that might please young readers and lovers of fairy tales. There is a little white horse in The Little White Horse, but it doesn’t feature especially prominently until the very end, when it is revealed to be a unicorn. 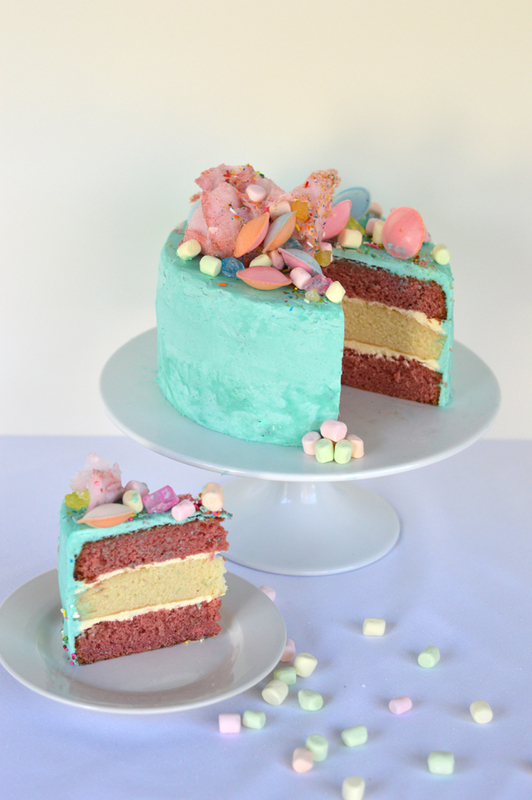 I suspect it’s intended to stand in for the pursuit of virtue or some such thing given the context, but it also gave me a good excuse to do something that I’ve wanted to do for a while: make an obnoxiously pink and blue cake covered with candy. Which is apparently how my weird baker’s brain decided to translate “unicorn”. No, I don’t know why this particular cake idea wouldn’t leave me alone. That said, it’s delicious. Usually when I make cakes, I use Swiss meringue buttercream frosting, which can be a bit of a challenge for inexperienced bakers. For this cake I used a German buttercream, a step up from the normal butter + powdered sugar + milk that many American bakers use and that has ruined buttercream for at least a few generations of cake-eaters. Since German buttercream uses a custard base rather than a sugar syrup base, it’s a little easier to make and it was perfect for this cake because in its vanilla form, it tastes a bit like French vanilla ice cream. 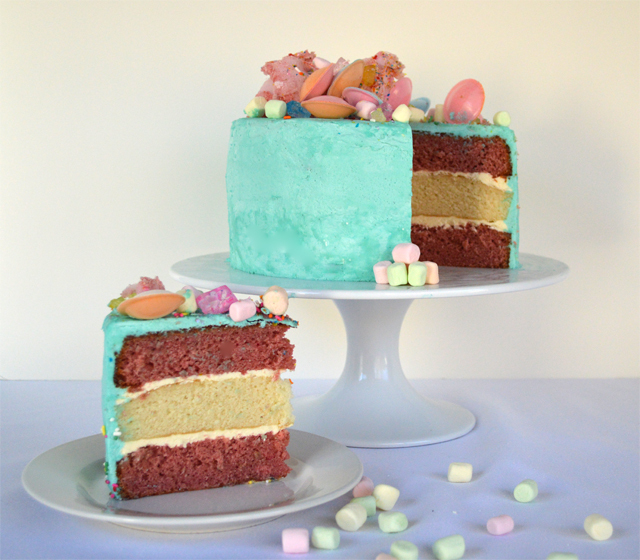 The cake itself is comprised of two strawberry layers and a vanilla layer, which all use the same homemade cake mix as a base. 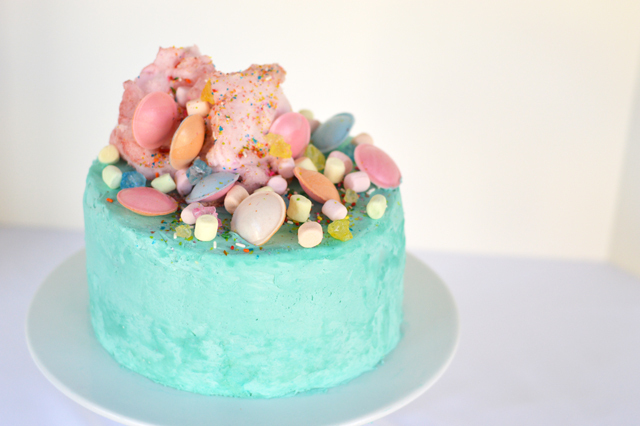 What really makes this cake fun though is the candy decoration on top. I just chose a random assortment of candies from our local mall’s candy store, Lolli & Pops. 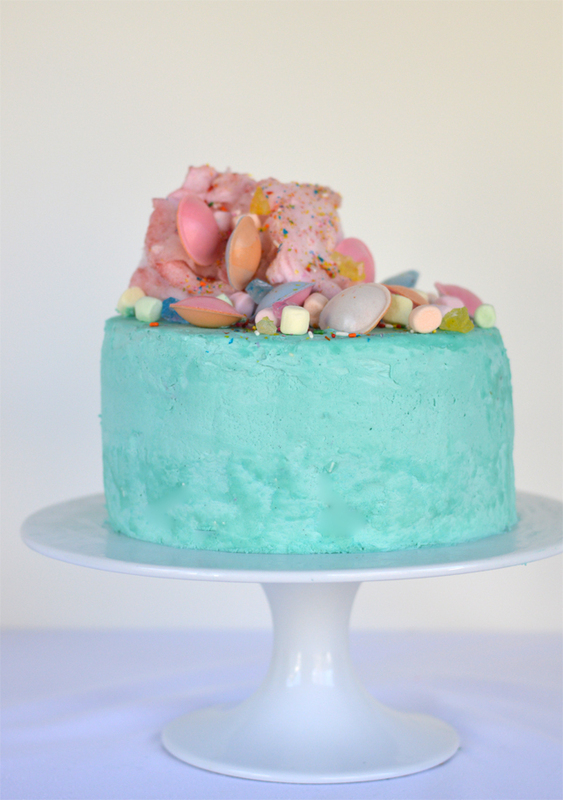 I’m not sure I can wholeheartedly recommend the use of cotton candy as a decoration unless you’re serving the entire cake immediately (like at a party) because the humidity in my kitchen deflated it rather quickly, but even after it lost some of its fluff, it was still delicious. And though literal-minded youngsters might not be amused by the lack of an actual unicorn, it’s fully colorful enough for a child’s birthday cake. So. 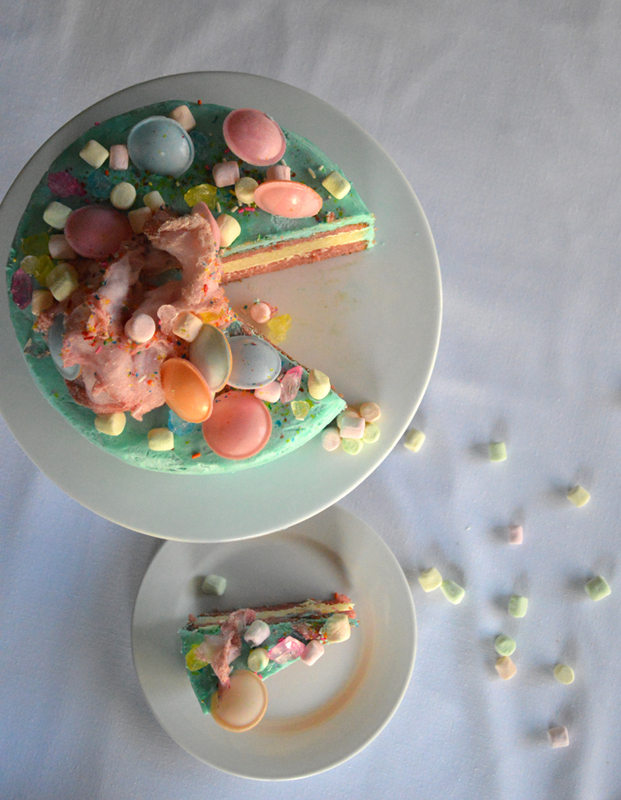 Strawberry cake with blue vanilla icing, multicolored marshmallows, sprinkles and cotton candy equals unicorn cake. Now you know. Elizabeth Goudge’s book “Linnets and Valerians” was one of my favorites as a kid–I re-read that thing until the cover was falling off. Similar elements to this one, it sounds like–orphaned kids, a dour but kindly uncle (this one had been the headmaster of a prestigious school, and had become a church deacon or similar in his retirement, IIRC). Many conveniently wise animals, a Miss Havisham-type character, and also folk magic. I was charmed by it at the time, but haven’t read it again in a few decades or so because I fear it would be seriously dated in specific ways (sexist, racist ways) I couldn’t bear. All the foods in that book, though, stuck with me for years. The various sweets they ate, the cakes, their efforts to make jam. All so vivid. Those old British fantasies, they knew how to do food. I loved Linnets and Valerians as well, although even as a child I found the implied romance rather creepy. Yes! That was fascinating. All the food descriptions! Just much more than I would ever expect to see now. It made me wonder how much of that was to do with the fact that rationing was still in effect. Like, a longing for normal childhood, normal food, fancy food? Anyway, it was just an idle thought, but I did notice that too. Yes, this was definitely big on traditional notions of femininity and masculinity: the heroine is told not to be aggravating while the hero is told not to be angry. Among other things. I think you’re right to be wary of rereading her.